Dr. Doni offers her analysis of the Autoimmune Protocol. She explains how its recommended diet changes can help decrease inflammation and address Leaky Gut. Part 9: Leaky Gut and Autoimmune Diseases – What’s the Connection? This week, we continue our exploration of autoimmunity by examining how changes to your diet can be the key to healing not just Leaky Gut but autoimmunity as well. One of the first steps is to eliminate any foods that may be contributing to your Leaky Gut. We know that gluten causes Leaky Gut in everyone to greater or lesser degrees—so gluten is out for sure. The rest of what to eat or not can be quite personal, but there are programs (or diets), such as the Autoimmune Protocol, that have been developed to help guide you. Today, I want to focus on the Autoimmune Protocol and give you my views on how best to use it to support you. After years of suffering with IBS, fatigue, headaches, joint/body aches, mood changes, anxiety, numbness, and weight gain, people become afraid they will feel this way their entire life. Doctors give them anti-depressants, anti-inflammatories, and IBS meds, but they get tired of being medicated all the time. A more natural way to feel better is to consider ways to eat differently to ensure you are getting the nutrients your body needs and avoid the foods that are causing problems for you. However, it’s all too easy to become overwhelmed with what to eat and what to avoid. In this article, I am focusing on the Autoimmune Protocol (or AIP) because it’s so popular. Personally, I like it because it includes dietary recommendations and simplifies the process for you—it tells you exactly what to do. But does it work? What is it really? Basically, what the creators of this diet have done is taken the paleo diet, tweaked it and turned it into a protocol designed to tackle autoimmunity. From my perspective as a naturopathic doctor, following the AIP can support healing of Leaky Gut, helping to heal autoimmunity in the process. AIP is named smartly; it states the condition it helps and appeals to the millions of people who are already following a paleo diet. Because AIP is so easy to understand, I’ve even seen people who don’t have autoimmunity choosing to follow it. And because it does support Leaky Gut healing, I can see why they would benefit from it. The drawback of AIP, in my opinion, is that while it tells you what to eat and what not to eat it is not tailored to individual needs. It makes a rather broad sweep to have everyone avoid all nuts, seeds, and nightshades, even if they don’t react to them. While this can be clarifying and helpful in many cases, it can also place unnecessary restrictions on an already restricted diet. By restricting one’s diet you can make it challenging to know what you CAN eat, so I like to gather information to help my patients “fine tune” the guidelines to fit them. One of the things I use with my clients is the Stress Remedy Programs (7-day or 21-day). In many ways, it’s similar to the Autoimmune Protocol because it has you avoid dairy, gluten, and encourages you to choose organic foods—but it also eliminates eggs, soy, sugar, and alcohol. Everything it does gets you at least 75% of the way to the full AIP, and then allows you to individualize the rest. The AIP has you avoid all nuts, seeds, beans, and legumes. These are all a good source of protein for vegetarians so I don’t tell everyone to avoid them because I want everyone to get the protein they need. What I recommend is an IgG and IgA food panel that tests which foods you are sensitive to. This will tell us if there are certain nuts, seeds, beans, and/or legumes that you need to avoid. The AIP advocates avoiding nightshades (tomatoes, potatoes, eggplant, and peppers). Although I don’t include them in the meal plan, I don’t typically emphasize avoiding them altogether. You could avoid them for a period of time to see it makes a difference for you and if it doesn’t, you may add them in moderation. The AIP eliminates all grains including non-gluten grains. In the Stress Remedy Program meal plan, I emphasize the protein, vegetables, and fruits, and offer suggestions for gluten-free grains if you choose. You could easily avoid gluten-free grains while following the Stress Remedy Program if you want to find out if that makes a difference for you. AIP has you avoid all sweeteners that do not have nutritional value, and minimizes fructose to less than 20 grams per day. 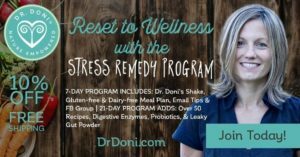 With the Stress Remedy Program, I do a lot of educating about sweeteners and help you to choose the less risky sweeteners in moderation (if desired). I also encourage you to shift meal proportions such that your intake of carbohydrates, such as fructose, is reduced. Counting the exact grams of fructose simply takes it to the next level of detail, which can be helpful if you have dysbiosis, fructose intolerance, and/or IBS. Doing a food sensitivity panel before starting the Stress Remedy Program is much more effective. Learn more about how to order a food panel here. Individualize your Autoimmune Protocol based on your specific food sensitivities. You might get some results without doing this, but they won’t be as thorough and you might make things harder for yourself by eliminating things you don’t need to. Look beyond what to eat and what not to eat, and make a meal plan that balances your blood sugar levels by emphasizing protein and healthy fats—unbalanced blood sugar triggers a stress response in your body leading to Leaky Gut which will make your diet far less effective. Complement the Stress Remedy Program with supplements* that support the healing of Leaky Gut: digestive enzymes, nutrients, herbs, and probiotics. We can determine your need for supplements to heal Leaky Gut when we receive your food panel results. To get a sense of the products I recommend, you may want to review the products that are included in the Stress Remedy Programs (7-day or 21-day) and/or the Leaky Gut product package. Having a diet to follow can make the difference between wanting to improve your health and actually turning your health around. AIP offers a wonderful support system for doing that, and you’ll find more and more health practitioners referring to it. My 7-day or 21-day Stress Remedy Programs. These programs help guide you towards dietary changes that heal your Leaky Gut, balance your blood sugar and hormones, and decrease inflammation. My Leaky Gut Solutions Package. It includes consultations with me, an IgG and IgA food sensitivity panel, and support for implementing dietary changes and integrating supplements to help heal leaky gut. Healing Leaky Gut can be a short or long process depending on the severity and current exposure to things that damage the gut lining. Next time, I will be continuing the discussion of how best to do this. To make sure you catch it, please subscribe to my weekly newsletter here. If you have questions or experiences with AIP, please do share them below. Paleo For Autoimmunity. (n.d.). Robb Wolf, former research biochemist and author ofThe Paleo Solution – The Original Human Diet. Retrieved October 14, 2015, from http://robbwolf.com/what-is-the-paleo-diet/meal-plans-shopping-guides. Foods and Arthritis. (n.d.). Physicians Committee for Responsible Medicine. Retrieved October 14, 2015, from http://www.pcrm.org/health/health-topics/foods-and-arthritis. I agree that the AIP protocol is way too restrictive. Simply not a reality for many, and a lot of people don’t realize that an overly “Dramatic” shift to a diet ‘THAT’ RESTRICTIVE can actually make an individual Worse, and weaker. It’s too dramatic of a shift and many quit in the first week and simply go back to thier normal eating habits. So thank you for pointing that out. However, are you for certain that your food sensitives test are accurate? According to Chris Kresser food allergy testing they are not accurate so what’s the point? Many food sensitivity panels are not very accurate. I’ve reviewed and used many of the labs that offer the testing over the years (for over 15 years) and I recommend the test that I find is most accurate and provides the clearest results. I find in practice that when patients eliminate the foods that show up, they are likely to see a difference. It is very true that it is important to go with a lab that provides accurate information.